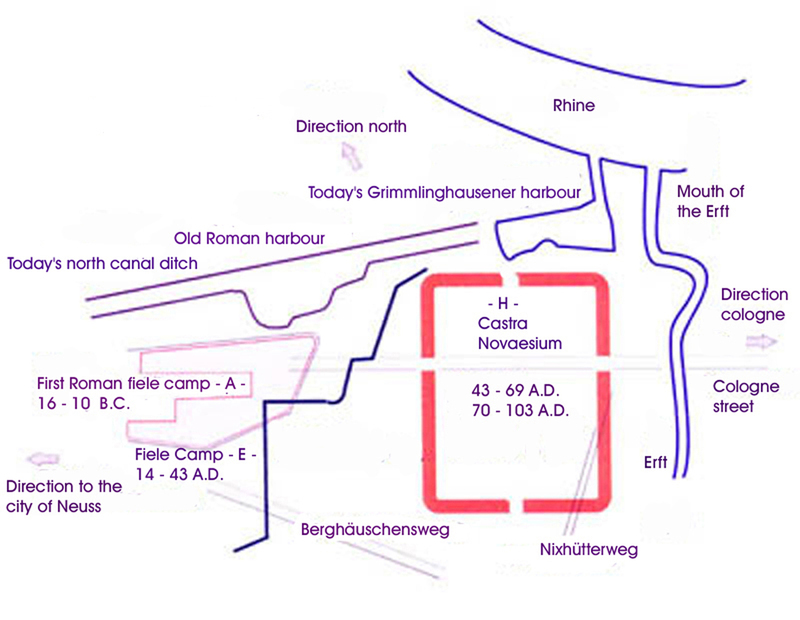 The legionary fortress at Neuss 43 - 103 A. D.
The first camp -A-, the last camp -E- and the place of the fortress -H-. Beside the terrain of the last Roman camp -marked with E - the LEGION XVI GALLICIA started the first building phase of the legionary fortress from 43 A. D. onward, that existed up to the withdrawal of the last legion of Neuss till 103 A. D. *7) Up to the completion of the new fortress the XVI. legion stayed for security reasons in camp - E -. After removal into the new legions' fortress the area of the camp was arranged for a new suburb (CANABAE).